Finland holiday cottage. 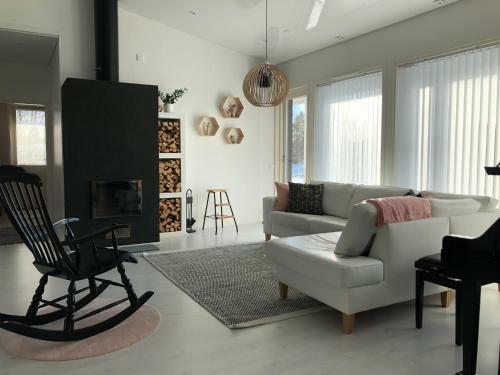 Located in Rovaniemi, 3.6 km from Santa Claus Village - Main Post Office and 5 km from Arktikum Science Centre, Villa Scandinavia provides accommodation with amenities such as free WiFi and a flat-screen TV. The holiday home is in an area where guests can engage in activities such as skiing and hiking. The holiday home includes 3 bedrooms and a kitchen with a dishwasher and an oven. The accommodation also offers a bathroom with a bidet. The holiday home offers a sauna. Guests can relax in the garden at the property. Ounasvaara Ski Resort is 2.1 km from Villa Scandinavia. The nearest airport is Rovaniemi Airport, 6 km from the property.